Chances are you and your family love to take your pet dog along on trips but worry about the potential mess to your car. With the Best Pet Car Seat Cover by TrioGato, it's have dog, will travel - you'll be the first in line, as you run to call your Man's Best Friend! The TrioGato waterproof car seat cover for pets is the perfect dog car hammock and seat protector. With extra side flaps for extra protection, it will fully protect the SEAT, DOORS and FLOOR of your car, truck or SUV or used to protect the trunk of your vehicle. 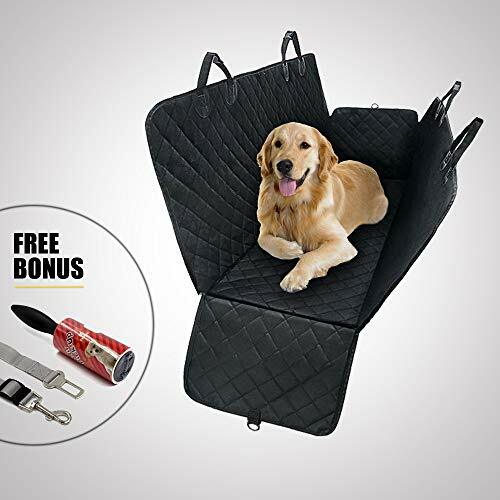 Enjoy our FREE DOUBLE BONUS - a Dog Seat Belt that attaches to your dog's harness along with a Pet Hair Roller for quick cleaning and hair removal! 54" x 58" universal size fits most standard cars, trucks, jeeps, vans, SUV's. Share backseat with family member, baby seat, outdoor equipment and more! Versatile backseat dog hammock for back seat features - A zipper that can be zipped down halfway to cover half of back seat only! Superior materials include black, quilted 5-layer 600D Oxford material dog car seat cover with stain-resistant PU coating; 2 waterproof layers; thick soft polytech filling; 210D Poly ripstop lining; and soft, nonslip rubber grip backing. Zippered side flaps protect doors and sides of seat as dog jumps in/out of car. Cover stays reliably in place, held down securely by headrest buckles, seat anchors and nonslip backing.  FREE DOUBLE BONUS Dog Seat Belt (attaches to harness) & Pet Hair Roller (for quick cleaning)!  SHARE BACKSEAT WITH FAMILY MEMBER with zipper opened halfway & cover over half of back seat only!  QUICK INSTALLATION AND CONVERSION between bench cover and hammock style - dog won't fall or jump!  EASY CARE with convenient machine wash; can also vacuum or hand wipe in between washes. If you have any questions about this product by TrioGato, contact us by completing and submitting the form below. If you are looking for a specif part number, please include it with your message.